© 2004 Robert A. Freitas Jr. Title art courtesy of Forrest Bishop. Note: The original lecture totals 181 MB so it is impractical to put all materials (especially the many movies) online here, and copyright issues also preclude the inclusion of certain other images here. Abstract. The main impediment to molecular manufacturing today is the lack of an experimental procedure for routinely and precisely building objects, atom by atom, at the molecular scale. The key to this is molecular positional assembly, or mechanosynthesis — the formation of covalent chemical bonds using precisely applied mechanical forces. After a brief description of the various diamond surfaces, I will describe a specific dimer placement tool that has been extensively investigated for diamond mechanosynthesis using various computational methods. This tool appears to be stable in isolation, and should be able to deposit carbon dimers on a diamond C(110) surface as required, during room temperature operation. Next, I present a preliminary proposal for a four-step experimental process by which this dimer placement tool, along with its associated macroscale handle structure, could be fabricated using presently-available bulk-chemistry techniques. My new tool fabrication process is the subject of the first (provisional) patent ever written on diamond mechanosynthesis, filed in February 2004. If a practical dimer placement tool can be built in this manner, it will allow the fabrication of improved dimer placement tools, thus opening up the entire field of molecularly-precise diamond fabrication — and, indeed, molecular machine manufacturing — to practical laboratory experimentation. Hello, I’m Robert Freitas. I’m here to talk to you about molecular manufacturing using diamond. After some introductory remarks, I’ll briefly look at the structure of the diamond surface, then suggest a possible tool for building diamond, and how that tool itself might be built. The main impediment to molecular manufacturing today is the lack of an experimental procedure for routinely and precisely building objects, atom by atom, at the molecular scale. The key to this is molecular positional assembly, or mechanosynthesis – the formation of covalent chemical bonds using precisely applied mechanical forces. The first and most famous experimental demonstration of molecularly precise positional assembly of individual atoms, albeit without forming lasting covalent bonds, was achieved by Eigler and Schweizer at IBM Almaden in 1989, when they used an STM to position 35 xenon atoms on a nickel surface to spell out the corporate logo “IBM” (Slide 3). The first complex positionally assembled molecularly precise structure which included formation of covalent bonds was created by Lee and Ho in 1999. Using a cold scanning probe tip on a silver surface in vacuum, they picked up one carbon monoxide molecule and covalently bonded it to an adsorbed iron atom using an electric pulse, then repeated with a second CO molecule at the same site, making a positionally-assembled molecule of Fe(CO)2, a simple rabbit-ear-shaped molecularly precise structure fabricated at a specific site on the silver surface. The first experimental demonstration of purely mechanical positional synthesis, or mechanosynthesis, was achieved in 2003 by Oyabu and colleagues at Osaka University (Slide 5). They lowered a silicon AFM tip towards a cold silicon surface and pushed down on a single atom, mechanically breaking its bonds to neighboring atoms, allowing it to bind to the AFM tip. Images showed a hole where the atom had been. Pressing the tip back into the vacancy replaced the selected atom, this time using mechanical pressure to break the bond with the tip. The greatest amount of theoretical analysis has explored the mechanosynthesis of carbon atoms, especially when arranged as diamond, starting with Drexler’s work in the early 1990s. The basic experimental objective looks something like this (Slide 7) [movie omitted]. You start with a flat diamond surface, bring in a mechanosynthetic tool, position it precisely over the workplace, lower it down to deposit, say, a carbon dimer on the diamond surface, lift away the discharged tool, then repeat with successive dimers, resulting in the positional assembly of diamond. Why the interest in diamond? Diamond has exceptional properties, such as high strength and extreme stiffness, high thermal conductivity and low frictional coefficient, and chemical inertness. Of even greater interest, previous theoretical analyses support the idea that molecular machinery can be made from stiff hydrocarbons, including diamond. CVD techniques can already make large gem-quality diamonds at a manufacturing cost of $100 per carat, up to several carats in size. But these are bulk processes which only produce a large featureless crystal of pure diamond. Diamond has already found many applications (Slide 10) in mechanical and electromechanical microdevices, sensors, and electronics. These two proposed diamond nanodevices (Slide 11) have not yet been built, but only analyzed theoretically. 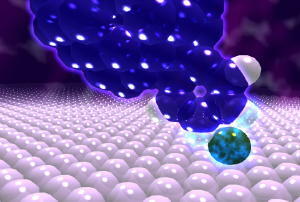 To build these nanomachines, we must be able to fabricate diamond, atom by atom. 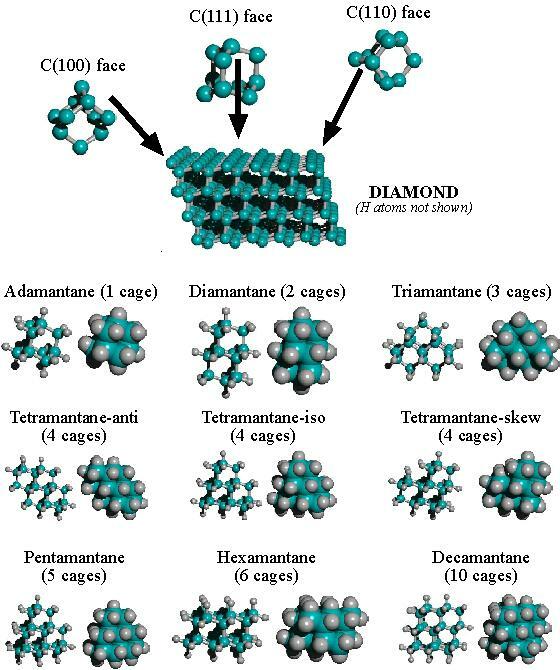 The smallest unit cage of diamond is a molecule of adamantane (Slide 12), which has 10 carbon atoms and 16 hydrogen atoms arranged in a tricyclic cage structure. When the adamantane cage is rotated into three specific orientations and laid out as an array, it defines the three primary diamond surfaces that we must learn to build – the C(100), C(111), and C(110) planes. For example, roll the basic adamantane cage downward. Arranging the cages adjacently produces one row of the C(100) surface. Adding more rows side by side gives an extended diamond C(100) surface. To make the well-known C(111) surface, turn the basic adamantane cage to the left. Setting the cages side by side makes a row of C(111). Putting many rows together gives an extended diamond C(111) surface. For the C(110) diamond surface, rotate the basic adamantane cage counterclockwise. Attaching cages side by side gives one row of C(110) surface. Stacking multiple rows gives an extended diamond C(110) surface. As a theoretical and experimental target, we like the simplicity of the C(110) surface which consists of neat staggered rows of carbon dimers (Slide 26). The C(110) surface is also nice because it doesn’t reconstruct either at high temperatures, or when dehydrogenated, unlike the other two diamond surfaces. A bulk-produced C(110) surface is entirely passivated by hydrogen atoms (Slide 27), eliminating any dangling bonds. Working with hydrogenated surfaces would require removing the H atoms, creating dangling bonds to more readily accept additional carbon atoms. One way to do this is to bake out the entire C(110) surface at a temperature above 1400 K, in vacuum [movie omitted]. This drives off the hydrogen, leaving a clean carbon-only surface with the same structure in the case of C(110) [movie omitted]. With C(111) and C(100), the surface structure changes when hydrogens are removed. The C(110) surface also stays the same afterwards, when it cools down [slide omitted]. Hydrogen abstraction tools, for selectively removing hydrogen atoms one at a time from a diamond surface, have also received some study. This shows a simulation done on the C(111) surface by Brenner’s group in 1994 [movie omitted]. The hydrogen atom comes right off. But besides removing hydrogens, we must be able to add one or more carbon atoms to a growing diamond surface in precisely chosen locations. One way would be to pick and place molecular building blocks such as whole adamantane cages. But control of simultaneous multiple bond formations between adjacent blocks is relatively difficult, and then our minimum feature size is about one block. Drexler proposed single-carbon additions using a carbene tool, as shown in this schematic (Slide 34). Computational studies of this tool on the C(100) diamond surface found that to avoid a significant energy barrier, the tip must approach from the side. Also, the carbene tool must be rotated 90 degrees around a vertical axis, during normal operation. To simplify matters, Ralph Merkle and I, and several colleagues, have studied two-carbon additions (Slide 35). A horizontal dimer placement tool deposits twice the atoms per operation as a carbene tool, and needs no experimentally challenging approach trajectories or twisting motions to complete the mechanosynthetic operation. Just straight in, and straight out. In a good dimer placement tool, the dimer should be bonded relatively weakly to the tooltip. These are some tooltips using a diamond C(100) or C(110) base [slide omitted]. Here’s some more tooltips on a base of diamond C(111), tetramantane isomers, and several others [slide omitted]. We found this new tooltip family that uses a lonsdaleite or hexagonal diamond structure for the base (Slide 38). The best is the “dicarbon bridge” or “DCB” motif where each yellow atom (a group IV atom) is bound to 2 central carbon bridges. Here’s the business end of the DCB6 tooltip (Slide 39). The carbon dimer is bonded to two group 4 supporting atoms, shown in yellow: silicon, germanium, tin, or lead – a series which forms progressively weaker bonds to the dimer. The dimer placement tool positions the carbon dimer and bonds the dimer to a precisely chosen lattice location, after which the tool is withdrawn, leaving behind the C2 dimer (Slide 40). We simulated the isolated tooltip using Density Functional Theory, or DFT, in Gaussian 98. These are the 3 stationary points of interest (Slide 41). Both active and discharged tooltips are minima on the potential energy surface. The undesired rearrangement in the middle is just a transition state on the potential energy surface, when “X” is a Group IV element. A molecular dynamics simulation of the tooltip at 900 K for 200 picoseconds using AM1 found no rearrangements [movie omitted]. A further simulation of this tool by our Zyvex colleagues at 1000 K for 5 picoseconds using DFT in the Vienna Ab initio Simulation Package, or VASP, also predicted the horizontal dimer structure would remain stable. Next we looked at dimer stability on the C(110) diamond surface. Jingping Peng at Zyvex used plane wave-based DFT in VASP to put down 1 isolated carbon dimer on the clean C(110) surface at room temperature, which looks quite stable (Slide 43). Note that the Local Minimum is the same as the proper lattice position, but a single dimer placed in the LM rotates toward the trough axis into the Global Minimum, misaligning with the crystal lattice. Next, we put down a second dimer adjacent to the first. There are 18 local energy minima (Slide 44), each a possible defect state if the dimer placement is not exactly right, with energy barriers between them as high as 1.8 eV in one case. The potential energy diagram at right shows most of these minima. Here’s the GM and 5 of the LMs for 2-dimer placement (Slide 45). The third from the left is LM2-4, the most intractable defect structure. To convert LM2-4 to GM2 – that is, to repair the defect – the structure would have to pass through two relatively high energy barriers of 0.85 eV and 1.8 eV. But if we can place the dimer into GM2, note that the two inside carbon atoms have rearranged to the ideal lattice position for the diamond C(110) surface. Only the two carbons at either end of the chain remain out of lattice position. Finally, we put down a third dimer next to the first two. There are now 35 local energy minima (Slide 46), with energy barriers between them as high as 3.2 eV in one case. Here’s the GM and a few LMs for 3-dimer placement (Slide 47). Note again that in GM3, the 4 inside carbon atoms have rearranged to their proper lattice positions, with only the end carbons still misaligned. This pattern should continue for dimer chains of any length that are sequentially assembled on the C(110) surface, if we can avoid defect states like LM2-4. How much positional accuracy is needed to avoid placing the second dimer in LM2-4? This potential curve for dimer positional placement on clean C(110) (Slide 48) shows the path from GM2 through transition state LM2-2 to the defect structure LM2-4. The required positional accuracy for inserting a dimer into GM2 while avoiding the nearest transition state leading to an undesired defect is 0.7 Angstrom for the leftmost dimer atom and 0.5 Angstrom for the second-from-left dimer atom. 0.5 Angstrom positional accuracy is very near state of the art (Slide 49) – both for positioning resolution and for positioning repeatability. At least three positioner systems have 0.5 Angstrom step accuracy, and one system has 1 Angstrom repeatability over a 1-micron round trip. Of course, the need for controllable end-effectors adds another experimental difficulty. In an actual tool for diamond mechanosynthesis, the DCB6 tooltip molecule would be attached to a much larger diamond structure, such as the extended tool shown here (Slide 51). If we position the extended tool over a C(110) surface and heat just the tool to 20 K, there’s hardly any motion [movie omitted]. At 80 K, there’s still not much motion [movie omitted]. At room temperature or 300 K, the dimer closest to the diamond surface is finally moving around a bit [movie omitted]. At 900 K, the motions become more severe [movie omitted]. A scatterplot of dimer motions [slide omitted] shows that thermal uncertainty increases as we move from the relatively stiff dimer-holding bonds of Silicon, at bottom left, to the less stiff dimerholding bonds of Germanium, at top, and then Tin, at bottom right. The extended tool is about twice as wide in Y, along the dimer axis, as in X, perpendicular to the dimer axis. That’s why at room temperature the thermal uncertainty of the dimer is plus-or-minus 0.5 Angstrom in X but only 0.2 Angstrom in Y (Slide 56). Adding a stiffening crossbeam reduces the room-temperature thermal uncertainty of dimer positioning in the X direction by half, shown here (Slide 57) in green, from plus-or-minus 0.5 down to 0.3 Angstrom, or from 0.3 down to 0.2 Angstrom at liquid nitrogen temperatures. So the 0.5 Angstrom nanopositioner accuracy nominally available today approaches what we need for mechanosynthesis on diamond C(110). Will the tooltip actually deposit a dimer on the diamond surface? Jingping Peng at Zyvex has tested our tooltip using DFT in VASP on a 10-node Beowulf cluster (Slide 58). Each image pair took 50 hours to calculate. We start with a 46-atom Germanium tooltip brought up to a 200-atom slab of clean diamond C(110) surface. The tip is raised or lowered in 0.2 Angstrom steps, then allowed to run for 200 femtoseconds at constant temperature. Here the Germanium tooltip is retracted from the C(110) surface at 300 K [movie omitted]. At 1.6 Angstroms up, the dimer detaches from the tooltip and drops into the global minimum on the C(110) surface. The complete deposition/retraction cycle also seems to work [movie omitted]. Note that this stepwise simulation doesn’t track continuous events, but rather is a series of snapshots of the system in slightly different positions to help us see which bonds will form and break at specific points during the cycle. When we retract a Silicon tooltip from the surface at 300 K, the dimer partly detaches in an uncontrollable manner [movie omitted]. But at liquid nitrogen temperature the dimer neatly detaches and drops into the global minimum on the C(110) surface [movie omitted]. Jingping’s collaborators have included David Mann and John Randall at Zyvex, along with Ralph Merkle and I, who are now at different institutions. So, how do we build the first tool? I’d like to share with you a preliminary proposal for building a 2-part tool (Slide 63). The first part, on the bottom, is the DCB6 tooltip molecule we’ve been discussing, though it could be any tooltip molecule with a diamondlike base. The second part, on the top, is the handle structure, though the actual handle will be much larger, maybe 0.1-10 microns in diameter – big enough for a MEMS manipulator to grab. At the apex of the handle structure, the tooltip molecule is covalently bonded to the handle structure, forming a complete tool (Slide 64). The manufacture of the complete positional diamond mechanosynthesis tool requires four distinct steps: synthesizing a capped tooltip molecule, attaching it to a deposition surface, attaching a handle to it, then separating the tool. We’ll go through the four steps in more detail. STEP 1. Synthesize the tooltip molecule, with its active dimer appropriately capped, using existing methods of bulk chemical synthesis (Slide 66). A capping group is temporarily added to the two dangling bonds of the carbon dimer, passivating the dangling bonds and chemically stabilizing the tooltip molecule for a solution-phase chemical synthesis environment (Slide 67). At right, we see a DCB6Ge tooltip molecule capped with two iodine atoms, passivating the reactive double-bonded dimer. This capped molecule is what we need to synthesize. I looked at 400 possible capping groups, of which only 93 are shown here [slide omitted], and applied 6 selection criteria. Iodine seems to satisfy the requirements, along with several other promising alternatives. The 48-atom iodine-capped DCB6Ge tooltip molecule has not yet been synthesized. I won’t say much about specific synthesis pathways – except that we’re looking into this. Over 20,000 adamantane-based compounds are already known. Adamantane derivatives and polyadamantanes are readily synthesized from scratch, including 2-cage diamantanes, 3-cage triamantanes, and 4-cage tetramantanes (Slide 70). Silicon-substituted adamantanes, or silaadamantanes, have been synthesized. The divinyladamantane molecule, at center, top, shows we can add double-bonded carbons onto the adamantane cage. Iceane, shown at bottom right, is the twinned 30-atom core structure of our tooltip molecule, and was first synthesized 30 years ago. Slide 71. Naturally-occurring diamondoids discovered by ChevronTexaco in 2002. For more information, see http://www.chevron.com/moleculardiamond/diamondtech/discovery.asp. Image © 2007 Robert A. Freitas Jr.
Adamantanes also occur widely in nature. Chemists at ChevronTexaco have extracted from natural petroleum dozens of polyadamantane molecules of various sizes and arrangements, a few of which are shown above (Slide 71). Many of these are available in bulk quantities for further experimental work. Next: STEP 2. Attach a small number of tooltip molecules to an appropriate deposition surface in tip-down orientation, with the tooltip-bound dimer bonded to the deposition surface (Slide 73). The purpose here is to grow isolated micron-scale crystals over tooltip molecule nucleation sites, rather than a continuous diamond film. So the deposition surface should minimize the number of natural nucleation sites. The selection criteria (Slide 74) are satisfied by “carbide exclusion” materials like Germanium, Gold, Copper, and Sapphire. Graphene sheets, like Graphite or Carbon Nanotubes, could also be used with nonhydrogenic CVD processes. Having chosen a deposition surface, at least three tooltip attachment methods can be identified. In Attachment Method A (Slide 75), capped tooltip molecules are directed as a beam in a scanning pattern across the deposition surface, as in Image “A”. Upon striking the surface, some fraction of the tooltip molecule ions, perhaps as few as 1%, partially fragment with the release of the capping group, producing dangling bonds at the C2 dimer which can then insert into the deposition surface in the desired orientation, as in Image “B”, creating a low density of preferred diamond nucleation sites. There are also many unwanted outcomes, as in “C” where only one atom of the capping pair is released, binding the tooltip molecule to the surface with just one bond through the C2 dimer. If beam energy is too high, impact bonding through the tooltip molecule base could occur, with migration or release of 1 or 2 hydrogen atoms, as in “D” or “E”. The harm from unwanted attachments is avoided by inspection or by post-process surface editing, which I haven’t time to discuss. In Attachment Method B (Slide 76), tooltip molecules are bonded to the deposition surface by non-impact dispersal and weak physisorption onto the deposition surface. This is followed by tooltip molecule decapping in vacuum via targeted energy input, producing dangling bonds at the C2 dimer which bond into the deposition surface, thus affixing the tooltip molecule to the surface in the desired tip-down orientation and again creating a low density of preferred diamond nucleation sites. STM-mediated positionally-controlled single-molecule dissociation of an iodine atom from individual molecules of diiodobenzene physisorbed on copper surface was demonstrated experimentally in 2000. The energetics of the bond-by-bond decapping process for an iodine-capped DCB6Ge tooltip molecule on a 3x3 unit-cell graphite surface can be tentatively estimated, in the diagram at lower left (Slide 77), using AM1. After each capping atom is removed, the conversion of the dangling C2 dimer bond to a new covalent bond between dimer and deposition surface appears to be energetically favored by 1.6 eV for the first bond and by 1.3 eV for the second bond. The presence of stray H or I ions can poison this reaction, so effort must be made to exclude them. Many other unwanted reactions can occur, like a tooltip molecule with one bond to the surface through the C2 dimer that loses one H atom from the side position of the base, as at lower right. Again, the harm from these unwanted states can be avoided by inspection or by surface editing, and their occurrence may be minimized by keeping the highest quality vacuum. In Attachment Method C (Slide 78), tooltip molecules are bonded to the deposition surface in the desired orientation using conventional solution-phase chemistry. For instance, the deposition surface could be functionalized with an appropriate molecular group, here labeled “X”. The tooltip cap combines with the functionalization group, leaving the tooltip molecule chemically bound to the deposition surface with 2 bonds through the dimer, crudely analogous to esterification. Another approach (Slide 79) to this Method is the 1998 synthesis by the Giraud group of divinyladamantane, a single-cage adamantane with two vinyl groups bonded to the same carbon atom in the cage, and subsequent dispersal of this molecule onto a polished hydrogen-terminated Silicon (111) surface. After exposure to UV irradiation, photochemical double hydrosilylation occurred, tethering the adamantane molecules to the surface through two -C-C- covalent bonds with minimal steric strain, and always in the same geometric orientation. With tooltip molecules attached to the deposition surface and positioned with their diamondoid bases pointed upwards, we go on to: STEP 3. Attach a large handle structure to the surface-bound tooltip molecule (Slide 81). Two ways to do this are nanocrystal growth and direct handle bonding. In Handle Attachment Method A (Slide 82), we grow new diamond onto the tooltip molecule base using standard Chemical Vapor Deposition or CVD. The adamantane or diamondoid nanocrystal base of each bound tooltip molecule serves as a nucleation seed from which a large diamond crystal will grow outward (Slides 83-87), in preference to growth on areas of the deposition surface where tooltip nucleation seed molecules are absent. CVD should proceed until enough bulk diamond crystal has grown, outward and around each of the tooltip molecule seeds, that the tooltip and its newly grown handle can be securely grasped by a MEMS-scale manipulator mechanism [movie omitted]. Deposition is halted well before adjacent growing crystals can merge into a single film. We know this Method will work because it has already been done. The first successful demonstration of surface-tethered adamantane molecules serving as nucleation seeds for diamond CVD was achieved by the Giraud group starting in 1998 (Slide 99). In their control run, divinyladamantane seed molecules were dispersed onto an H-terminated Silicon (111) surface, then CVD was done, yielding barely one hundred diamond grains per square millimeter. But in their experimental run, the seed-dispersed surface was additionally exposed to UV irradiation prior to CVD, tethering the seed molecules to the surface. Subsequent CVD produced the image at right, a yield of hundreds of thousands of diamond grains per square millimeter – and all of a very uniform 2-micron size, indicating essentially all adamantane-based nucleations. Admittedly, the core of our tooltip molecule is iceane, the unit cage of hexagonal diamond or lonsdaleite, not pure adamantane as in conventional cubic diamond crystal, but lonsdaleite can also be grown experimentally via CVD. In Handle Attachment Method B (Slide 100), an SPM-manipulated dehydrogenated diamond shard is brought down vertically onto a surface upon which tooltip molecules are already tethered. The shard’s dangling bonds attach it to the tooltip base. Retraction of the shard breaks the dimer bonds to the surface and pulls off the tooltip molecule, yielding a tool for diamond mechanosynthesis with an active C2 dimer exposed at the tip. This method produces an inferior tool because the position, orientation, number, and stiffness of attached tooltip molecules is poorly controlled. Still, Method B is much easier from an experimental standpoint, so it may be possible to manufacture early, though less capable, mechanosynthetic tools in this manner – and without as much positional accuracy. Finally, STEP 4. Mechanically grasp and break away the diamond crystal-handled tool from the deposition surface, in vacuum (Slide 102). The covalent bonds between the tooltip, through the C2 dimer, and the deposition surface will mechanically break when pulled (Slide 103). This yields either the desired mechanosynthetic tool having a naked carbon dimer attached, most probable according to preliminary AM1 analysis, or else a tool with no dimer attached, essentially a “discharged” tool requiring recharge. The tool will be securely grasped by, or bonded to, a conventional SPM tip, a MEMS robotic end-effector, or other similarly rigid and well-controlled microscale manipulation device. Once the completed mechanosynthetic tool is detached from the deposition surface, the exposed C2 dimer radical is extremely chemically active. A typical UHV vacuum on the order of 1 nano-torr should give the experimenter, on average, more than 1000 seconds after tool detachment before tooltip poisoning is likely to occur due to impingement of stray atoms, ions, and molecules. Note that a vacuum of 1 nano-torr inside an enclosed 10,000 cubic micron box (Slide 104) contains, on average, far less than one contaminant molecule – usually making, in effect, a perfect vacuum. So the smaller we can miniaturize our workspace, the longer we can extend the working life of an active tool. Once we have a primitive tool that we can fabricate and manipulate, what’s the first thing we should build with it? The simplest thing is probably a single plane of dimers, spelling out the logo of the corporate sponsor (Slide 106), on diamond. The bigger challenge is to build something useful – like a better tool, which will allow us to bootstrap to more precise operations, and to use one tool to replicate a second tool, under human guidance. Many different kinds of tools should also be designed and tested. This won’t be trivial. Here [movie omitted], I tried the simplest approach of tilting the tooltip molecule to align one of its C(110) faces with the diamond C(110) workspace surface. While a few of the steps shown here may look plausible, and VASP has simulated placing the first 3 adjacent dimers on diamond C(110), we haven’t yet designed or modeled an entire validated assembly sequence. Larger diamond nanostructures should be stable during construction, but careful simulations must be done to verify this expectation. Another key improvement is to design tools that can be used, then recharged and returned to service, not just thrown away after a single application. This makes more sense for a commercial manufacturing process. In one scheme (Slide 108), the spent tool is recharged with acetylene, then the hydrogens are removed using an abstraction process, restoring an active carbon dimer at the tip. These improvements lead to the next generation of durable, rechargeable mechanosynthetic tools. This example (Slide 109) uses my new crossbar tooltip motif to minimize the thermal positional uncertainty footprint and provide good dimer placement accuracy. Using such next-generation tools, we can build simple linear structures like this diamond Logic Rod (Slide 110). After that, we could build more complicated diamond-based molecular machine components like this universal joint (Slide 11) designed by Drexler and Merkle [movie omitted]. The methods described here can get us to the starting gate of molecular manufacturing. We’ll be able to build diamond objects out of carbon atoms, dimer by dimer. The next steps (Slide 112) are to build a better tool, then to build recyclable tools, and so forth, down the list. Each of these steps should yield commercially “useful” outputs, improving the likelihood for research funding. What useful products can we build using molecular manufacturing? That’s applications, and I’ll be talking about that tomorrow in my lecture on nanomedicine and medical nanorobotics (Slide 113).